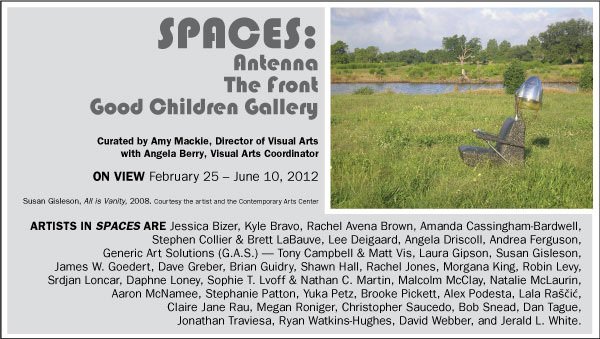 The Contemporary Arts Center (CAC), New Orleans is proud to present Spaces: Antenna, The Front, Good Children Gallery (February 25 – June 10, 2012), the first exhibition to bring together these collectively organized, cooperatively run artist spaces located on or near St. Claude Avenue in New Orleans. Since 2008, Antenna, The Front, and Good Children Gallery have embodied a thriving intellectual and artistic spirit in the city, evidenced through their programs that support both emerging and established artists. What sets Antenna, The Front, and Good Children Gallery apart from other initiatives located in New Orleans is their organizational structures, through which artist members curate exhibitions of other artists’ work or present their own. Spaces is an exhibition that focuses on the individual, the collective, and, most importantly, the way in which the members of these collectives interface through the exhibitions and events they organize. Spaces include Locally Localized Gravity, presented at the Institute of Contemporary Art, Philadelphia, PA in 2007 and Collective Creativity at the Kunsthalle Fridericianum, Kassel, Germany in 2005. The former focused on artists as producers and the latter on artists who work collectively or collaboratively. For Spaces, the second floor gallery of the CAC will be divided into two sections: a traditional group exhibition featuring work by the members of Antenna, The Front, and Good Children Gallery, and an archive that includes a timeline, as well as web and print materials (brochures, postcards, posters, catalogs, etc.) from each artist and from each collective. Collaborative group projects elaborating the collectives’ particular aesthetics and politics will also be presented in the archive. Three site-specific projects by Rachel Avena Brown & James W. Goedert, Bob Snead, and Jonathan Traviesa will be on view just outside the gallery. In addition, numerous events, performances, screenings, and conversations organized by artists from the collectives will occur in various locations throughout the CAC through June 2012 (schedule to be posted on the CAC website). The CAC will produce an exhibition catalog at the conclusion of Spaces.